Last Saturday when Jeremy made chili for our pumpkin carving party I was looking for a vegan cornbread recipe to compliment his delicious chili. 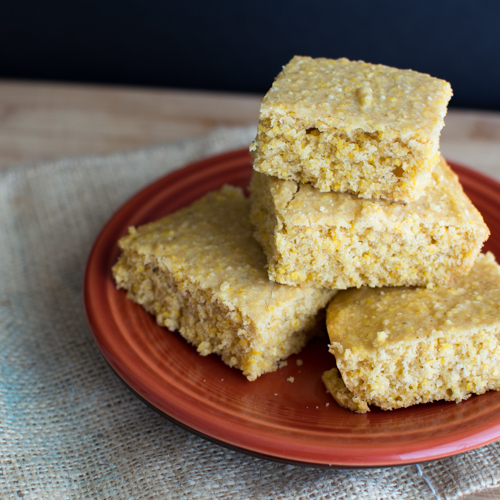 While I love oil-free cooking, I’m still convincing myself when it comes to oil-free baking. Granted I’ve made some delicious cakes but there have also been cookies that don’t seem like cookies and breads that are gooey and not right in the middle; I blame that on being oil-free. So when I followed google’s first search result for vegan cornbread to Isa Chandra’s Post Punk Kitchen and found a minimal amount of oil in the recipe, I was A-Okay about it. 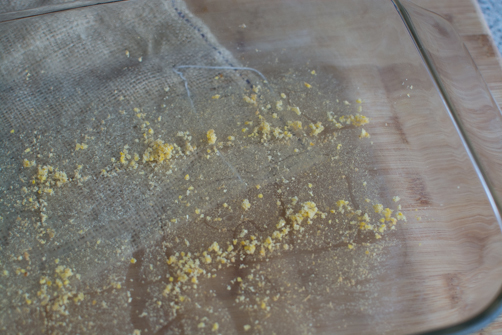 The recipe also made a cake pan’s (9×13) worth of cornbread versus the usual 8×8 square pan. Perfect for a gathering (upcoming holidays – hint hint) or when you also enjoy cornbread for dessert with a little maple syrup. It was delicious and the knife slid right through. The texture is perfect. 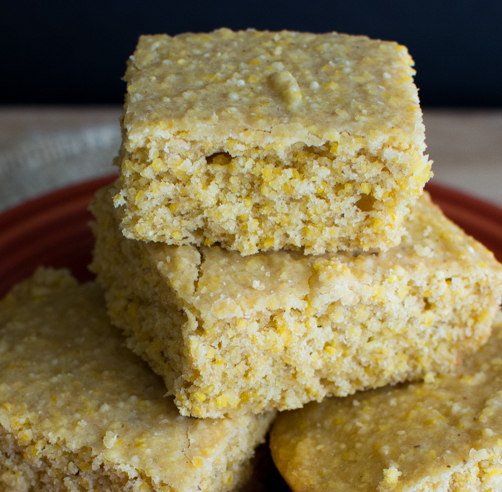 It’s been awhile but it reminded me of the Jiffy cornbread I grew up with. So have at it. 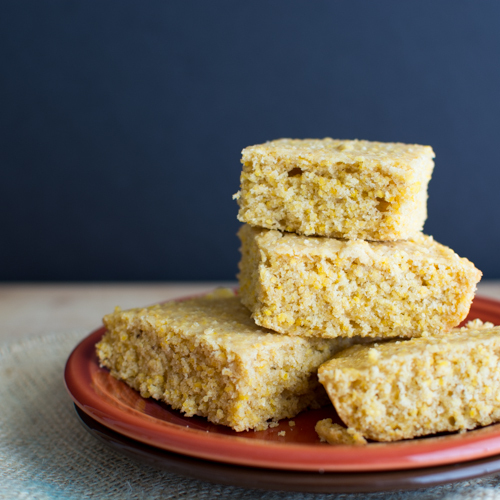 Go make this cornbread. All of our guests loved it too. Your pan might just look like this. Oh and I almost forgot. Happy Halloween!!! 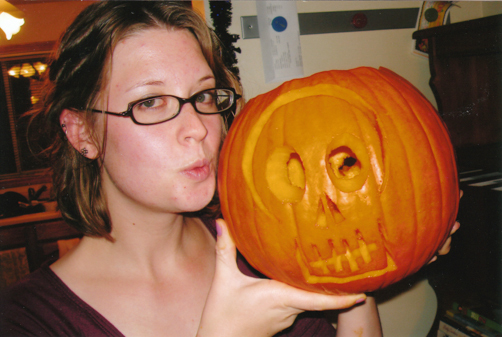 This is from the last time we carved pumpkins in 2006. Do you like sweet syrups with your cornbread? I used to LOVE love love dark karo syrup on cornbread, corn muffins, and pancakes growing up. Pure corn syrup. What’s that? 😉 Thankfully maple syrup stands in perfectly. 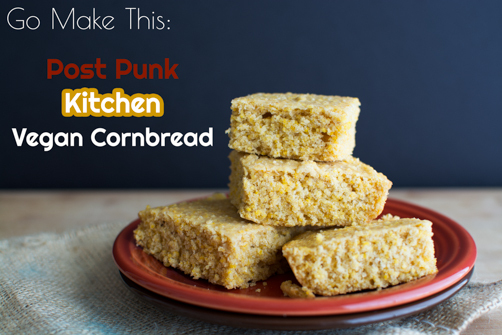 I’m gonna try this corn bread. Thanks!